Since the early stages of the movement, it is true, those taking part have been in a deadlock on the question of making a commitment to nonviolence. At a planning meeting in Tompkins Square Park prior to September 17, I recall one young man in dark sunglasses saying, knowingly, “There is a danger of fetishizing nonviolence to the point that it becomes a dogma.” In response, a woman added a “point of information,” despite being in contradiction to what Gandhi or King might say: “Nonviolence just means not initiating violence.” The question of nonviolence was ultimately tabled that night and thereafter. “This discussion is a complete waste of time,” someone concluded. However, this is long overdue for an update. Every major statement so far issued by the General Assembly at Occupy Wall Street’s Liberty Plaza has included a definitive nod toward a commitment to nonviolence. 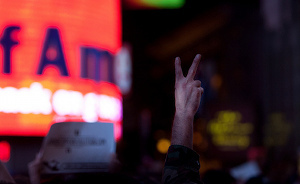 As I see it, the upshot is clear: Occupy Wall Street has made a firm and consistent commitment to nonviolence. The question remains, of course, what those participating understand nonviolence to actually mean. As new challenges arise, that will be an ongoing discussion.